Gutters are an essential form of protection for your home, helping to funnel away runoff and debris from your roof so that it doesn’t cause major problems like roof leaks or pooling around the foundations that can lead to rot, mold, and other serious and expensive damage. Of course, you have to keep them clean and well-maintained if you want to ensure optimal performance, and this means cleaning them at least annually, and more likely twice a year. Whether you clean your gutters yourself or you hire the qualified professionals at Top Notch Seamless Gutters to manage you gutter cleaning and maintenance needs, you should know that there are additional products that might add convenience and cost savings to your existing gutters. When you install leaf guards over your gutters, you could significantly cut back on the amount of leaves, twigs, pine needles, and other debris falling into these funnels. This, in turn, could improve water flow throughout the year and prevent clogs, along with a host of other potential issues. In addition, leaf guards could help you to cut back on gutter cleaning. With leaf guards preventing debris from getting inside your gutters, you could reduce cleanings to just once every couple of years, although it may depend on your particular environment and the leaf guards you get. The experts at Top Notch Seamless Gutters offer a variety of leaf guard options, and we’re happy to help you select the product that is perfect for your home. Contact us today for a free consultation and estimate. Top Notch Seamless Gutters is proud to partner with three amazing manufacturers offering leaf guards for gutters. This premium gutter protection brand is growing in popularity for two reasons: performance and cost. It’s among the most affordable premium options, and the patented “S” design provides for extremely consistent flow of water through existing gutters. 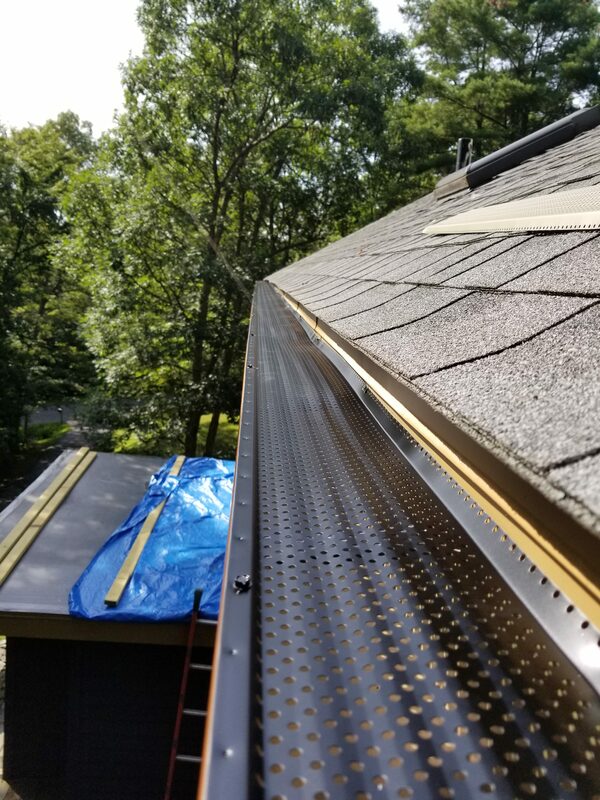 While leaves and debris slide right off the sloped surface of this gutter guard, water is funneled into your gutters, where it will be carried through downspouts and away from your home. Plus, this product will blend seamlessly with your roofline and stop harmful pest infestations, making Leafproof a great addition to any gutter system. The first company to begin manufacturing stainless steel mesh guards back in 2003, Leaf Solution enhances home gutter systems with a proprietary system of three mesh seams that run the length of a gutter, creating a slope that allows leaves and debris to slide right off while water gains access to the gutters below. The dipped seams in the medical grade micromesh actually change the direction of flowing water so that it is forced into the gutter, ensuring no spillage over the side. In addition, the low-profile design makes Leaf Solution practically invisible from the ground. You’ll be happy to hear that they also offer a lifetime money-back guarantee. There are a couple of features that differentiate Shur Flo products from others on the market. Unlike many other leaf guards, Shur Flo doesn’t slide under the shingles at the edge of the roof, so no lifting of shingles is required and you won’t have to risk voiding your roof warranty. Instead, this leaf guard fits snugly inside the top of the gutter. Even so, its low-profile design means it will remain hidden from view. While most of the leaves and debris that fall on this leaf guard will slide right off, any remaining debris will dry up and be blown away thanks to a design that promotes air flow circulation. Shur Flo offers a 20-year, transferable warranty. While leaf guards provide a great way to cut down on gutter cleaning and maintenance, they also work to protect your existing gutters and your property from common types of damage. By keeping leaves and debris out of gutters, leaf guards not only prevent clogs and overflow that can lead to pooling, leaks, and other damage, but they also prevent the harm that can result when water and soggy debris become trapped in gutters and downspouts. When water and vegetation are left to sit in gutters and downspouts, they can cause some materials to rust, or lead to harmful mold growth. If these materials remain when winter weather hits, water could freeze in gutters and downspouts, causing them to crack or grow so heavy that they tear away from the eaves. Standing water can also attract mosquitos, and uncovered gutters full of leaves are a draw for all kinds of vermin looking for nesting habitat. Leaves, twigs, and pine needles piled up in gutters can be a fire hazard, as well. It only takes one ember drifting on the wind and falling into a clogged gutter to start a dangerous building fire. The experienced professionals Top Notch Seamless Gutters work hard to ensure the longevity of your gutter system and the safety of your structure. Contact us today to discuss the benefits of leaf guards for your gutters and schedule an appointment for a free estimate.